Before RHIC began operations in 2000, some were concerned that it would produce black holes that would threaten the earth. Here's why those concerns were unfounded. 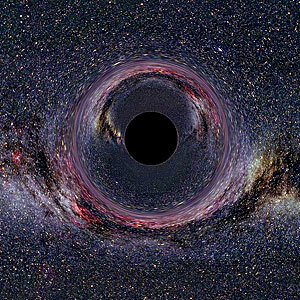 Creation of a black hole that would "eat" ordinary matter. Initiation of a transition to a new, more stable universe. Formation of a "strangelet" that would convert ordinary matter to a new form. "We conclude that there are no credible mechanisms for catastrophic scenarios at RHIC," said committee chair Robert Jaffe, Professor of Physics and Director, Center for Theoretical Physics at Massachusetts Institute of Technology. View the committee report (PDF). Added Brookhaven Director Marburger, "Nature has been creating collisions of energies comparable to those at RHIC for billions of years, and there is no evidence of any kind of disaster related to those collisions. RHIC does not take us beyond the limits of natural phenomena. It brings a rare phenomenon into the view of our instruments so we can puzzle out its inner workings." Horatiu Nastase, a member of the high-energy physics theory group at Brown University, wrote a paper, posted on the preprint website arxiv.org, in which he claimed that collisions at the Relativistic Heavy Ion Collider could produce the analog of a black hole. Horatiu is referring to a mathematical similarity between the physics of the real world, which govern RHIC collisions, and the physics that scientists use to describe a theoretical, “imaginary” black hole in a hypothetical world with a different number of space-time dimensions (more than the four dimensions — three space directions and time — that exist in our world). That is, the two situations require similar mathematical wrangling to analyze. This imaginary, mathematical black hole that Horatiu compares to the RHIC fireball is completely different from a black hole in the real universe; in particular, it cannot grow by gobbling up matter. In other words, and because the amount of matter created at RHIC is so tiny, RHIC does not, and cannot possibly, produce a true, star-swallowing black hole. This does not mean, however, that RHIC cannot study some of the phenomena that happen in the vicinity of black holes, as explained in a paper we wrote with Kirill Tuchin, also of Brookhaven's theoretical nuclear physics group. The explanation for this begins with Einstein’s “Equivalence Principle,” which states that gravity and acceleration (or deceleration) are actually equivalent forces. The principle explains why a person going up in an elevator feels slightly heavier, just as they would if gravity on Earth were stronger. In the same way, the rapid deceleration of RHIC ions as they smash into each other for a very short period of time (about 10-23 second) is similar to the extreme gravitational environment in the vicinity of a black hole. This means that RHIC collisions should emit a bunch of thermal particles similar to the “Hawking radiation” emitted by a black hole. Since Hawking radiation is the cause of black hole decay, not formation, its existence would be yet another reason that RHIC cannot produce a real gravitational black hole. RHIC does not, and cannot possibly, produce a true, star-swallowing black hole.